As originator of a travel series called Railways of the World, going to Casablanca, Morocco's largest city, by rail on our personal version of the Marrakech Express was a wonderful way to start off the week and celebrate the new year. We enjoyed the journey so completely that the route from Marrakech (3 hours in total) seemed far too short. However, as we soon learned from the staff on board, visitors can travel between many of Morocco's principal cities by rail. That includes the Northern port of Tangier, a few miles from Spain with its famous Talgo Train service (see notes below). As many will agree, Rail Travel is still one of the most practical, inexpensive and relaxing of all modes on transportation, and this route to Casablanca was a shining example of price plus convenience. We traveled in a modern, first class coach, enjoying the privacy of a 6-seat compartment all to ourselves, with ample overhead storage for luggage and carry-ons. The one way tickets purchased at the counter without reservations were less than $15 in U.S. currency. Getting Around: It is now close to a month that we have been visiting Morocco and I am amazed at how easy it is to get around in a city the size of Casablanca. We have found the taxi drivers courteous and knowledgeable, and the prices affordable. I will comment on this aspect later in this series because I had the same impression on my first visit to Casablanca in 2001, when we saw and photographed many of the city's main attractions in a very short time. Much more to come regarding our latest visit to Casablanca. Morocco's largest city, Casablanca has a population of over 3 million and is the nation's commercial hub. Being Morocco's hub, it is also the largest port of the Maghreb, a facility that authorities claim has more activity than Marseilles, the French Mediterranean port city on which Casablanca was modeled many years ago. The design, known as "Mauresque" after the Moors, is a combination of traditional Moroccan design with what were at the time the very latest in Parisian styles. Visitors to Casablanca will enjoy the seacoast area with its fine dining spots, the famous Hassan II Mosque, the bustling central market area, the Habous district, the Royal Palace, the Mohamed V square, and the residential area of Anfa. 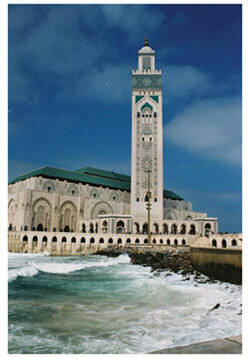 Located near the capital city of Rabat, Casablanca is also the site of Hassan II University. The above photo was taken by Africa Travel Magazine's Editor Jerry W. Bird in 2002 during his first stay in Casablanca. E-mail Africa Travel Magazine with your own travel experiences in Morocco.